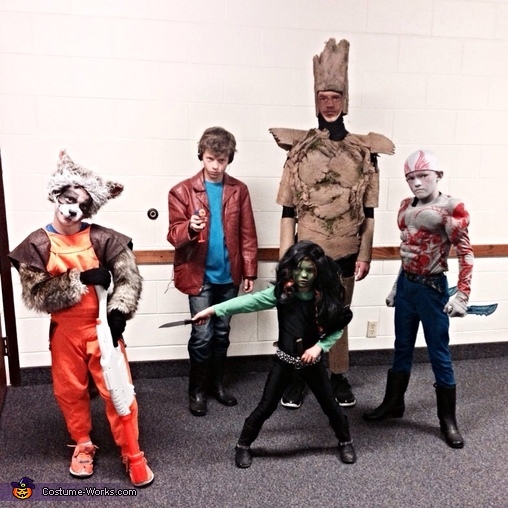 My oldest son is Groot, next son is Starlord, next son is Drax, next son is Rocket, and my daughter is Gamora. These where fun to make. The Drax costume is hand draw and painted, muscles added afterward. Groot is made out of cardboard, plastic, duct tape, ribbon, hot glue and paint. My son did a lot of the work on this. Rocket was made from a large sweatshirt reworked. All the costumes are homemade. These were particularly challanging this year because mom is working and going to school. Great Job and use of materials.